**VRM: SELLER WILL ENTERTAIN OFFERS BETWEEN $535, 000 - $565, 000. LIST PRICE EQUALS AVERAGE OF LOWER AND UPPER RANGE. ** Hidden gem located on Dog River. 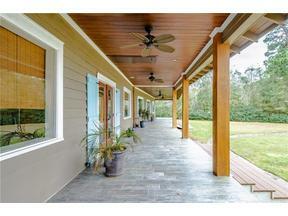 This home plus mother in law suite sits on 2.65 acres and has almost 300 ft of water frontage. The main house is 3/2 built in 1930's and as all the original charm. It features a beautiful stone fireplace, hardwood floors, and built ins. The newly added 1/1 mother in law suite is seamless and looks original to the cottage style home. Complete with granite counter tops, custom cabinets, crown molding, double vanity, wood floor, large walk in closet and own spacious laundry room. There is a two car detached garage and one car attached garage. The back porch runs the length of the house and overlooks Dog River. The large private lot also features a fire pit and pavilion for family and friends to gather. This unique property is a special find and will be your forever place to retreat. *Listing Broker makes no representation to square footage accuracy. Buyer to verify.